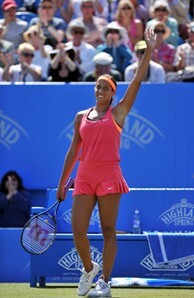 Madison Keys waves to the crowd after reaching her first WTA final, in Eastbourne, England. Throughout the year, EmiratesUSOpenSeries.com is featuring players who could make an impact during this year's Series. Here’s a look at 19-year-old American Madison Keys. The Baseline: Madison Keys has an impressive collection of “youngest” feats in tennis. In 2009, she became the youngest player (14 years, 48 days) since Martina Hingis in 1994 to win a WTA match, and that same year she defeated Serena Williams in a World TeamTennis encounter. Then, in 2011, she became the youngest player since Nicole Vaidisova in 2005 to win a main draw match at the US Open. Keys has added to the list ever since – youngest player in the Top 100, youngest in the Top 50 and, now, youngest in the Top 30. The Illinois native, who turned 19 in February, improved to No. 30 in the world after reaching the winning the Wimbledon tune-up in Eastbourne, England, last week. Keys’ run included victories over world No. 7 Jelena Jankovic in the opening round and No. 9 Angelique Kerber in the final, adding to the string of Top 20 wins she’s accumulated in her young career. She also defeated Simona Halep en route to the semifinals in Sydney, Australia, earlier this year, and topped Alize Cornet in Fed Cup play in April. In 2013, she notched victories over Li Na, Dominika Cibulkova and Carla Suarez Navarro. The Breakdown: Perhaps most impressive for Keys is the variety of her victories. The win over former French Open champion Li came on clay in Madrid, while her run to the quarterfinals in Birmingham, England, in 2013 and to the title in Eastbourne this year came on grass. Hard courts, though, remain Keys’ most comfortable surface, complementing her booming serve – her 126 mph offering in the final against Kerber was the fastest on the women’s tour this year – and her big forehand while providing a true bounce that sits comfortably in the zone for her 5-foot-11 frame. Keys is still growing into her game, with errors sometimes coming in bunches, offsetting her many winners, but her big-time game and rare athleticism for her size mark her as a potential Grand Slam champion. That sort of major success is likely a year or more away, but for now Keys is surely a contender to be seeded at the US Open – and a very realistic candidate to be playing into the second week.